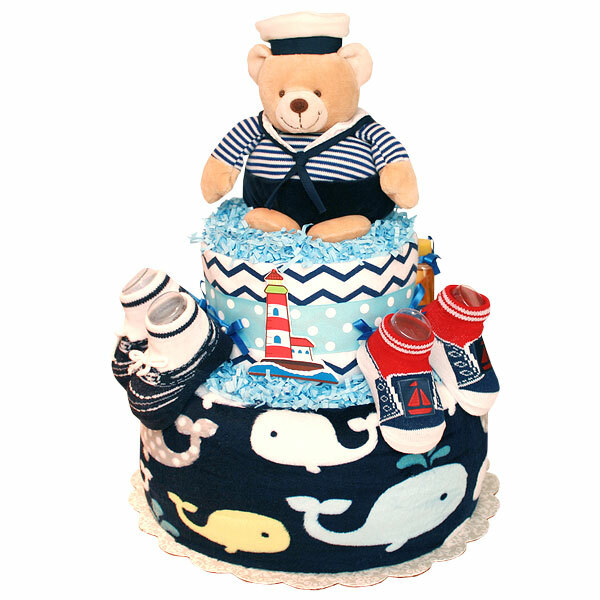 Practical and handmade, great gift for any new mom, two tiers Sailor Bear and Whale Diaper Cake is made of 30-35 Huggies Snug&Dry diapers size 2 (12-18 lbs. ); One sailor bear plush toy, One flannel receiving blanket 100% cotton, One plush blanket with whales; Two pairs of baby socks with nautical theme; One JOHNSON'S Baby Powder Pure Cornstarch with Aloe Vera & Vitamin E (Gently absorbs excess wetness to keep skin dry and soft) 1 1/2 oz; One JOHNSON'S Baby Shampoo (This mild, tearless formula baby shampoo is as gentle to the eyes as pure water) 1.5 fl oz; One JOHNSON'S HEAD-TO-TOE Baby Wash (Bathe your baby in pure gentleness) 1 fl oz; Wooden embellishments with nautical theme. Diaper cake is wrapped with a really fun ribbons and bows. Decorated with blue crinkle paper.